Forget about a secure future: Today’s jobs don’t even offer a secure present. The era of one-company careers is largely gone, and now the latest shift in labour markets is piling on the anxiety for many who do manage to get hired. They’re likely to land in an arrangement that falls short of what jobs used to be like. Driving cars for Uber is the poster-child for this alternative work, but it extends across the spectrum, from contract graphic design to on-call lab technicians to factory hands hired through agencies. How many new jobs fall into this category? All of them. Or at least, all the net new positions — more than 9 million — created in the US since 2005, according to a study this year by Lawrence Katz and Alan Krueger of Harvard and Princeton universities. Put it down as another cause of this year’s electoral revolt, ammunition for the argument that something’s fundamentally wrong with the economy. Plenty of Americans like the flexibility in the new world of work, but many more are there involuntarily — and finding their income is volatile and benefits hard to come by. 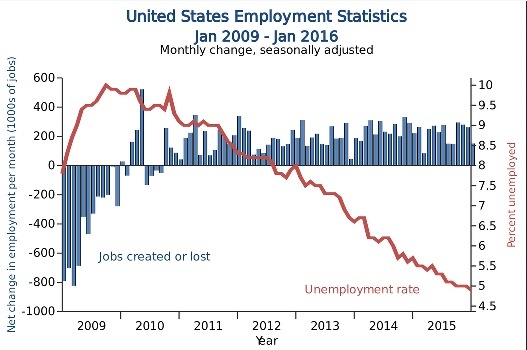 The US jobless rate, hovering around 5 per cent, is near what economists call full employment. Other data help to square that fact with the grievances driving presidential campaigns by Donald Trump and Bernie Sanders. Wage growth has been modest, labour participation is down and Federal Reserve Chair Janet Yellen last week flagged an “unusually high” number of people working part-time because they can’t find anything longer-term. Then there’s the nature of the openings created during seven years of recovery. Katz and Krueger’s study, updated in late April, looked at four groups: independent contractors, on-call workers, workers for temporary-help agencies, and those provided by contract companies. The government hasn’t surveyed this slice of the workforce since 2005, so the paper is a first look at the Great Recession’s impact. It found that workers in all “alternative” categories are paid less than their counterparts in traditional employment and are likely to work fewer hours. Gabe Luchkowsky’s job at an auto-part assembly plant in Avon, Ohio, might once have fallen into the permanent category. The 35-year-old found the position last year via a temp agency, after being laid off from a full-time post at a community college. At $12 an hour, it was a relief at first, until the absence of basic guarantees sank in. Katz and Krueger’s research shows that among the alternative workforce, independent contractors are happiest with their lot — 84 per cent of them prefer working for themselves. “You make your own hours, you are your own boss, you don’t have to answer to anyone,” said Dina Scherer, 34, a wardrobe stylist and personal shopper for eight years. She finds some clients via the task-matching website Thumbtack and has also contracted to work for companies including American Express Co.
Scherer, who lives in New York, does acknowledge a downside: “You have to drum up your own business. You do hustle a lot. Sometimes you don’t know where your next job is coming from. It does bring a little bit of anxiety.” Another group, on-call employees, are split fairly evenly on whether that status suits them. About three-quarters of temp workers hired via an agency would prefer a permanent job. Katz and Krueger say more research is needed to pin down the causes of the shift, but they advance a few tentative explanations. It could be the impact of the Great Recession — in which case the phenomenon might prove temporary. If technology is driving change, by making it easier and cheaper for companies to contract out tasks, it’ll be harder to roll back. Gene Zaino sees a combination of the two forces at play — one that’s benefiting his business, MBO Partners. It handles back-office tasks for independent contractors, ranging from billing and collection to making sure taxes get paid. More than 50,000 use the service, typically people doing “knowledge work”. Too easy, some economists argue: The balance between employers and their workers has gotten out of whack, with knock-on effects for the whole economy. On the campaign trail, candidates promise to bring back old-style jobs and spend less time talking about how to make the new kind work better for more people. One politician who’s addressed the issue recently is Democratic Senator Elizabeth Warren of Massachusetts: She said last month that health and retirement benefits, and labour laws, need an update. Adam Cobb, an assistant management professor at the University of Pennsylvania’s Wharton School, says the change is largely driven by financial markets, which reward companies that hold as few assets as possible — including workers.